Splitting, Wooden Trough Making, Boring Wood Pipe, Dressing Beams, Furniture Making and Repairing, Treadle-Powered Threshing Machine, Hot-Air Water Pump, Apple Butter Making, Cider Making, Bee Keeping. About six thousand people attended the Festival this year. There is every indication that a Craft Center will become established to serve the public throughout the year. Thus in the Pen-Mar Highlands the agrarian and craft life of Mennonite-Amish forefathers demonstrates an unbroken continuity with the past. Here is an example of how a people with an inherited agrarian culture can sustain it together with an effective adjustment to modern modes of living. The Mennonite-Amish farms in the Pen-Mar Highlands are on the increase. They are beginning to use more machinery yet still retain their horse and buggy, the horse-drawn plow, the traditional mode of dress, and the retention of their own handmade household needs and furniture. They are not prone to accept new household appliances and furniture. They are a quality-conscious people. Whatever they produce is of the best. Their work is their recreation. In the foreground Dr. Alta Schrock, founder and director of Penn Alps. 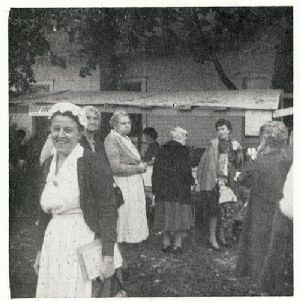 Picture taken at Springs Festival October 1962.